Anugerah Muzik Dayak (AMD) 2016 hosted by Dayak Artistes and Musicians Association (Dama) has finally ended with a big smile to all the winner. Congrats to all the winner and not forget to DAMA. 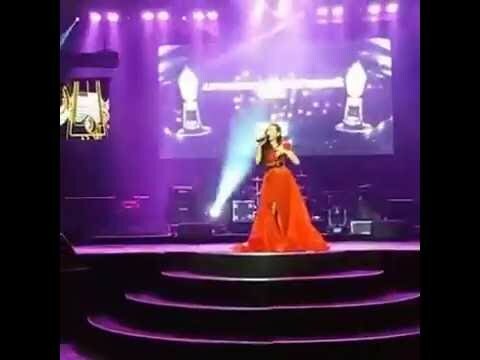 Cita Citata, adding a wow factor during the award event; where she perform live a hits dangdut songs ‘Goyang Dumang’, ‘Sakitnya Tuh Di Sini’ and ‘Perawan Atau Janda’. 01. Masterpiece - Best Iban Album awards "Ngarap Ka Nuan Nikal Pulai", Best Vocals for Duo or Group and Best Performance awards for "Ngap Sayot". 02. Melissa Francis - Most Popular Song and Best Ballad awards "Sepenuh Nyawaku", Best Iban Song awards "Andau Pengerindu". 03. Karen Libau - Best Pop Song, Best Female Vocals and Best New Artiste awards "Karam Ba Ati". 04. Mezzavoce - Best Rock Song award "Paded". 05. Michael Gayut - Best Single Song and Best Male Vocal awards "Kubur Cinta". 06. Embat Lala, Monica Elen and Harry Usup Umbar - Best Lyrics award. 07. Harrington Suring William - Best Music Video award. 08. Hairee Francis - Best Music Arrangement for "Sepenuh Nyawaku". 09. Masan Kaya - Best Album Cover for Sullivan "Pengerindu Lama". 10. Ezra - Best Bidayuh Album "Ezra". 11. Carrie Geres - Best Bidayuh Song "Tenggie Ku". 12. Lake Himang Anyie, Antonio Jawi and Cindy Nifkiman Ahid - Lifetime Achievement Award, special recognition for Iban, Bidayuh and Orang Ulu artiste. 13. Zachery Francis Ubu - special award for his accomplishment in acting. As seen above; Anugerah Muzik Dayak (AMD) 2016 awards finally been answers to whose deserve to received it. Congrats again. Hope next coming Anugerah Muzik Dayak shall be big cause AMD 2016 has shown it all; especially to recognize and acknowledge the best among the best of those involved in the Dayak music industry.